West Ham manager Sam Allardyce would be "absolutely delighted" if striker Andy Carroll is part of Roy Hodgson's England World Cup squad this summer. The 25-year-old's aerial prowess was a key factor in the Hammers' 2-0 Premier League victory over Tottenham. Carroll has scored twice in 15 outings since returning from injury in January. "If Roy decides to take him along, Andy would be absolutely delighted and so would I. He is as fresh as a daisy," said Allardyce. "He hasn't had much football this season so it wouldn't harm him." Carroll, capped nine times, was a constant threat to the Tottenham defence on Saturday, and his far-post header went in off Harry Kane to give the Hammers the lead. Stewart Downing's 20-yard free-kick sealed victory, securing his side's Premier League status with a game to spare. "Andy has put in a performance that got us rolling. It was a fantastic header for the goal," said Allardyce. "His overall performance has to come together, and it came together against Tottenham." 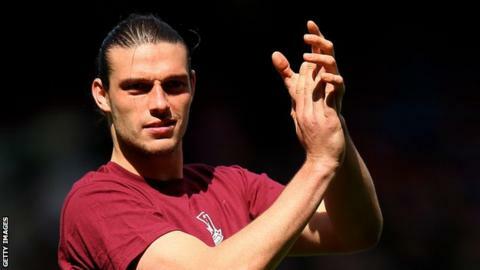 The Hammers boss said there is more to come from Carroll, and hopes he impresses in their final game of the season, at Manchester City on Sunday, 11 May. Hodgson will name his 23-man World Cup squad, plus seven standby players, the following day. Allardyce said: "If he doesn't quite get there, he can rest this summer and look forward to a full pre-season. "When you miss a full pre-season, and miss the first half of the season, it is always very difficult to get the top edge of your performance but he's been getting there week-in and week-out." Victory, which ended a run of four successive defeats, helped ease the pressure on Allardyce. "We played really good football," he said. "For the majority of the game we outplayed Tottenham and gave a very good account of ourselves and the football we can play. "When players are in top form like they were against Tottenham, they get the ball down, they have got confidence and pass it to each other. That's what you want."